It has been a little while since my last post. With the holidays approaching quickly, this has been a time of preparation and planning. We encourage the kids to give handmade gifts. I am busy crocheting and making gifts as I believe in setting the example. This is a fun time to incorporate the crafting into our homeschooling. Website such as Family Fun and Crayola have many ideas for kid-friendly projects. Home Depot and Lowe’s hardware stores have kids craft classes where the children are able to build a wood project. A trip to your local library can yield children’s craft books that are a treasure trove of ideas to choose from. Handmade decorations are another option to crafting for the holidays. Children love to help in decorating the table and home. Woven paper placemats are fun. Choose colors that compliment the holiday or season. Make a simple woven rectangle with the paper ends wrapped around and tucked into the weaving to finish the edges. The options are numerous. You can find many on Pinterest to give you inspiration. The focus for us is to teach the children to make gifts that are meaningful. Yes, there are plenty of ideas out there for the fast crafts that kids can make. They have their place in a child’s enjoyment. As a homeschooling Momma, I agree wholeheartedly with Charlotte Mason’s attitude of teaching children to make handcrafted items that require the child to learn a skill. Making clay ornaments are fun, but are something that can become a tradition shared throughout the years. They are simple enough for a very young child. You can start with a simple hand print ornament. Next, they can make ornaments using a cookie cutter to cut out the shapes, then painting the ornament after the clay has been baked and hardened. An older child can later make ornaments by modeling the ornaments into shapes or figures. Of course, there are many other materials that can be used for ornaments, Clay was given only as one example. To make the holiday crafting a learning experience, I am helping Little Miss to learn a new skill each week. One week, she may do a set of the fabric wrapped coiled coasters. Another week, she may make little linen napkins by cutting a large square of fabric and unraveling the edges all around the border about 1/4 to 1/2 inch wide. Making decorations for the Christmas tree are sometimes a project that is done in one sitting, while others are projects that will take her several days or longer. Teaching her to make projects that take time to complete is a productive way to teach her to stick with a project and see it through. At nearly 7 yrs old, she is far from too young to learn this skill. One simple, but time consuming project is making the raffia garland to go around a small Christmas tree. We have a small one that will be set up on a tabletop. The garland idea is one that I found online years ago. Basically, you take a length of twine and tie pieces of raffia to it. The end result is a beautiful, natural looking garland that has a very homespun look. To tie the raffia onto the twine, you cut raffia into 6 inch long pieces. Fold one piece in half and wrap around the twine. Thread the cut ends of the raffia through the loop at the fold and pull snug. Continue doing this along the entire length of twine. It is simple enough for her to do on her own, yet will teach her patience. Pookie is making gifts also with help. Due to the limited fine motor skills, his gifts will require much aid from me for him to complete. He is doing well though. We have to work in short spurts of time, so his gifts are not as time consuming as Little Miss has. The gifts are ones that he is able to do with limited aid. The clay ornaments are one idea. He is also able to make paintings. Using his favorite activity of painting as a craft medium, he is able to paint a blank canvas journal cover to give as a gift. The idea with him is to use the skills he does have to stretch his horizons. For our family, the whole idea of holiday crafting it to make and give gifts that are from the heart. Teaching children to give of themselves through their talents and time is a precious gift in and of itself. It helps to teach them to think of others, sharing their time and talents with others. Little Miss is Growing Up! 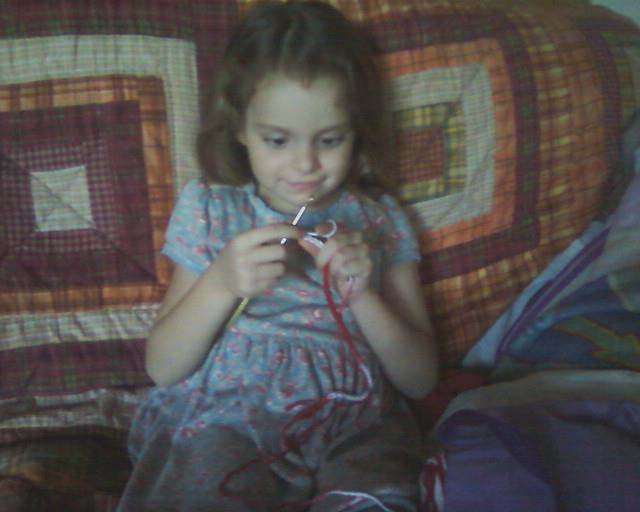 Little Miss learning the chain stitch. Our Little Miss is just growing up too fast. My youngest daughter, I had thought she would be my baby girl forever. This past week, she watchd as I was crocheting a dishcloth. After a while. she remarked to me that it looked like fun. She then asked me to teach her. I had a ball of cotton yarn and an extra crochet hook, which I have given to her. On Sunday afternoon, I sat with her and taught her to chain stitch. She is now working on making a chain that can be used as garland on a small Christmas tree. Some days, Little Miss is very much still a little girl. She keeps reminding me that her 7th birthda will be here in a few months and she will be a big girl then. LOL It is cute to hear her so adament about that. She loves her Barbie dolls, yet is just as interested in baking bread or doing the more old-fashioned homemaking skills. At her age, washing laundry by hand with a washboard is still fun to do. Each morning, now that the cooler weather has arrived, she enjoys a cup of “little people coffee” as she calls it. A nice warm cup of cocoa! She also loves having a cup of herbal tea at lunchtime. A favorite activity is to help me make my buttermilk-raisin scones served warm with cinnamon-butter to serve with the afternoon tea. A real treat is when we have a “high tea” complete with the little meal. I adore my little “big girl” and all the facets of her personality. She is a joy and a blessing. After wasting nearly an entire battery charge on my netbook to do it, finally remembered my password to the blog and was able to get on the website. Had to change my email and password, which are now noted in a safe place. Starting tomorrow, I will be posting more. The past week has been wonderful. The kids are both loving the Heart of Dakota curriculum and doing well with it. Even Pookie is able to do many of the lessons with slight adaptations to make the activities match his physical abilities. I will post much more, including a few pictures over the next day or two.